Living… on Redondo Beach in Los Angeles. His brother Vic was shot and killed in Los Angeles some time ago, but Vincent isn’t letting it slow him down. Vincent has just returned home from Amsterdam for a new job. Profession… hitman. Vincent was hired by his boss, Marsellus Wallace, a big shot gangster in the area. He and his new partner Jules Winnfield carry out whatever tasks Marsellus gives them, whether it’s threatening local punks or executing them on the spot. Interests… heroin, bloody steaks, cruising in his red Chevy Malibu, and a good suit. Vincent appreciates the more expensive things in life, thanks to his lucrative job as a hitman. Relationship Status… messy. 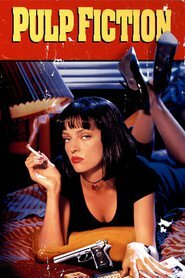 Marsellus asks Vincent to take care of his wife, Mia Wallace, while he’s in Florida. So he takes her out to Jack Rabbit Slim’s, a 1950s-themed restaurant, where they chat about her failed career as a television actress. Though, he knows it’s probably a bad idea to get involved with her and risk the wrath of his boss. Apparently, Marsellus threw a guy off a balcony just for giving his wife a foot massage. Challenge… returning a valuable briefcase to his boss. Marsellus keeps his most prized possession in a briefcase that was recently stolen by a gang. It’s up to Vincent and Jules to recover it and take out those who are responsible along the way. Personality… cool, lackadaisical, and logical. Vincent doesn’t let his emotions get in the way of his work or his personal life. He’s a nitpicker who likes to have things under control and predictable. Although he can get a little philosophical, he still likes to make a joke and have a good time when he’s hanging out with Jules or Mia. Oh, and he's also not afraid to get his hands a little bloody either. Vincent Vega's popularity ranking on CharacTour is #1397 out of 5,000+ characters. See our top-ranked characters and read their profiles.